Directed by William S. Hart and produced by Thomas H. Ince for Kay-Bee Pictures and the New York Motion Picture Company, the screenplay was written by C. Gardner Sullivan. According to modern sources, the assistant director was Cliff Smith and the art director was Robert Brunton. One of the early five-reel feature length silent movies, The Return of Draw Egan was exhibited on October 1, 1916, at the Realto Theater in New York City. 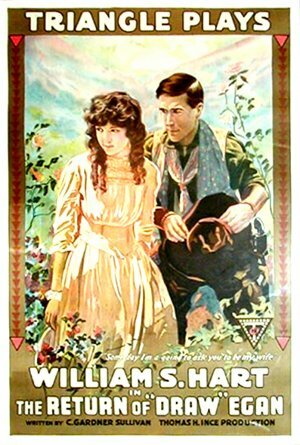 The western was re-released in 1924. It is currently available on DVD. The setting is the American Wild West. The notorious outlaw leader “Draw” Egan (played by Hart) and his gang is chased by a posse of lawmen to his remote mountain cabin, where they are trapped. During a fierce shootout, Egan opens a trapdoor and they escape through a tunnel before the posse can overwhelm them. Blake turns Yellow Dog into a model community, while hiding his criminal past, and plans to move on soon. But when he sees the mayor’s daughter, Myrtle Buckton (played by Wilson), he decides to stay on as marshal of Yellow Dog. Beginning a romance with the God-fearing young woman, he proceeds to settle down and become a genuinely lawful and respected member of the town. Then Arizona Joe (played by McKim), a member of Egan’s former gang, shows up in Yellow Dog to make trouble. He threatens to expose Egan’s past if he tries to make him obey the law and not help him take over the town. The marshal gives in for a while, but then decides that the welfare of the town is more important than his romance with Myrtle. When he goes after Arizona Joe, the outlaw keeps his word and tells the whole town about Draw Egan. During the final showdown, which is short and brutal, Egan shoots and kills Joe. He then surrenders himself for arrest, but the grateful townspeople refuse to hear of it and offer to keep him in office. He is also prepared to give up Myrtle, but she tells him that his past is unimportant and they begin making plans for their future together.